What’s with the disappearing act?! Sorry readers, blogging fell by the wayside…again. 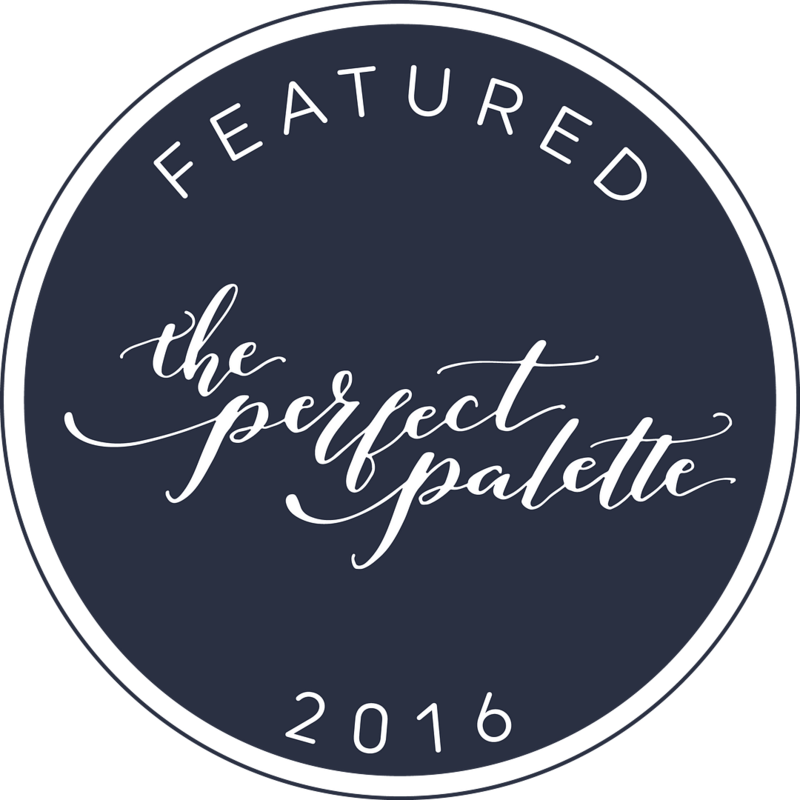 Luckily, I’ve got a great post for you today that was totally worth the wait. Without further adieu, KER-BLOOM! When I grow up, I either want to be a full time letterpress artist or produce a magazine… the next artist in the series is lucky enough to do both! 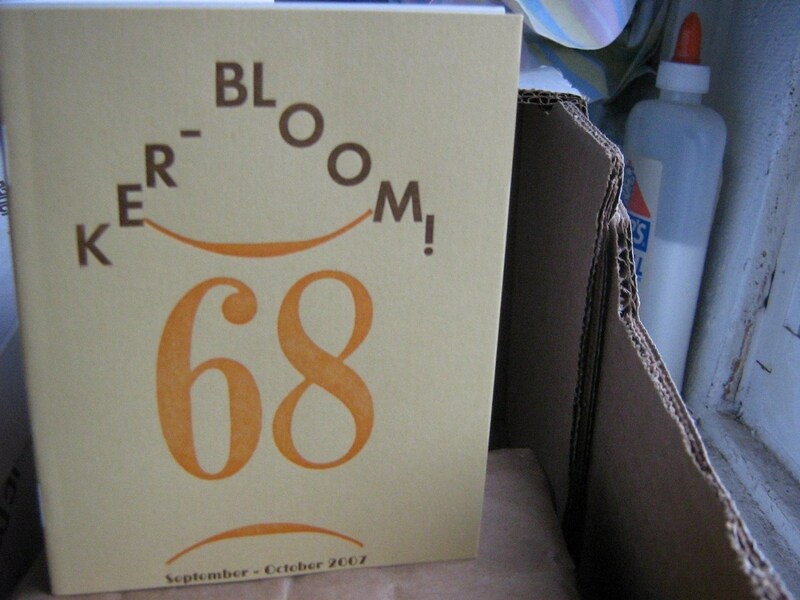 For the last 15 years, Artnoose has written, designed and produced an issue of Ker-bloom letterpress zine every other month. I’ll admit, this post is mostly self-indulgent, I just wanted a peek inside Artnoose’s world. But there’s a lot of great advice below, enjoy! 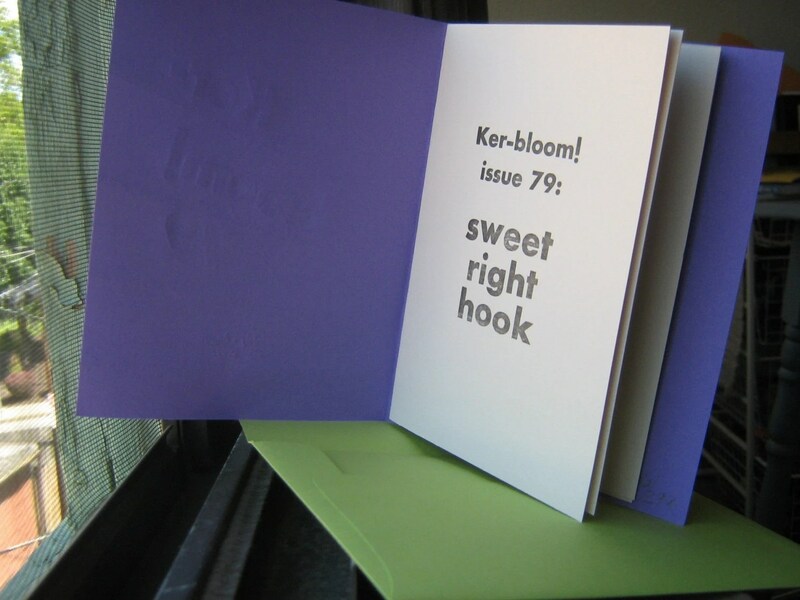 My zine Ker-bloom! is a letterpress-printed personal zine. I started producing it in 1996 because I thought I had enough to say to fit into a zine. At the time I was already doing letterpress printing, and so I honestly figured it would be the most accessible means of production available to me. Over the years my reasons for making it have changed. It has often been my lifeline to the outside world when everything in my life was going to the dogs. It has also been my way of inspiring myself to keep going. After a while my personal identity became sort of wrapped up in it, and I have gone on tour several times because of my zine. How do you define “zine”? My shortest answer—the one I give at craft fairs—is that it’s a self-published publication. The defining factors are somewhat vague but often include: doesn’t have an ISBN, not for profit, made by a person/collective rather than a company, not large enough to be a newspaper, etc. There are a lot of publications that dwell within gray areas of the definition, like perfect-bound issues of Cometbus— are they books or zines? I’m okay with the fact that the demarcation lines are fuzzy. How did you learn letterpress and book arts? I went to the California College of Arts and Crafts and took the bookmaking class taught by Betsy Davids. I learned letterpress and bookbinding from her. For the next year I was both the teacher’s assistant for the bookmaking class as well as the shop tech for the printmaking department. After that it was just years and years of practice. I still know some basic bookbinding although I don’t use it terribly often. 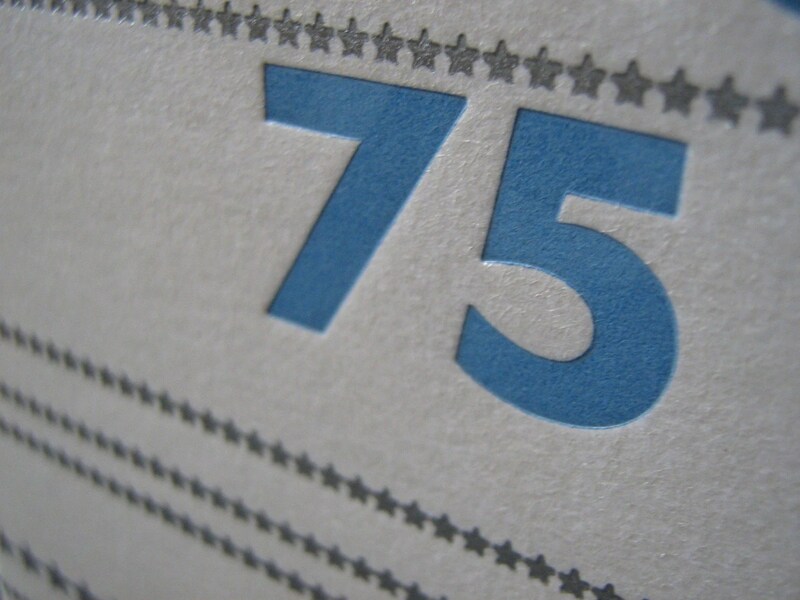 Tell us about your process—producing a zine every other month for over 10 years seems like a ton of work! This summer I will have been printing my zine every other month for 15 years, never skipping any or being late. It is a ridiculous amount of work, and it’s funny how over the years my life has evolved into two month cycles. The odd months of the year are my brewing months—when I mull over what I’m going to write about next and what the cover is going to look like. By the beginning of the even month I like to have the topic chosen and sometimes even a draft written up. The even months are production months. I once calculated that it take me 40 hours to physically produce an issue, although I haven’t recounted recently to see if that’s changed. Regardless, I always have to keep my zine schedule in mind when making travel plans or life plans in general. There were times that I was working two jobs, and during those years making my zine was really stressful. I’m not sure if it’s evolved that much, in that it’s the exact same size as it’s been for 15 years. I’m a little more experimental with my cover design, and sometimes I try to mix things up a little because I’ve been writing it for so many years. For example, I recently made a Mad Libs issue, which is something I’ve been wanting to do for a long time. My greatest challenge is still the self-doubt that comes with doing any ongoing project: is my writing any good, do people like my zine, does public opinion matter, should I be doing this at all, should I do something else? Stuff like that pretty much all the time. What inspires you? How do you come up with content? My brain is full of content. Sometimes it’s a matter of just choosing which idea to write about next. Occasionally I’m at a little bit of a loss for ideas, but this has only happened every few years or so. Other times I have my ideas planned out months in advance. Sometimes I have ideas for a zine for years before I actually write them. I heard about Etsy in 2005 when it first started. Some zine folks told me about it. At the time it was free to list and there were no expiration dates on the listings. I figured it was worth a shot since it was free. At the time I also had an online store that didn’t get many sales. It wasn’t long before my Etsy store far outsold my other one. Listing subscriptions to my zine was also a great boon—I have a lot of new subscribers from people purchasing them on Etsy, which is really nice because they get to read multiple issues and it’s almost always a repeat purchase after a year. My main job is as a self-employed letterpress printer, doing mostly wedding invitations and business cards. Selling on Etsy definitely helps out though. My zine is in the following bookstores: Bound Together Books (SF), Needles & Pens (SF), The Long Haul (Berkeley), Powell’s Books (Portland), Left Bank Books (Seattle), Quimby’s (Chicago), Firestorm (Asheville), Internationalist Books (Chapel Hill), Book Thug Nation (Brooklyn), Bluestockings (NYC), and The Big Idea (Pittsburgh). It is also available online in a couple of distros: parcellpress.com and littleblackcart.com. Both of these distros, by the way, have copies of popular issues I’m completely out of, so I recommend checking them out in addition to my Etsy shop. Photos are really important for the listing, especially that first photo. I used to have a wider shot for the first photo and then detail shots for the rest, but now I try to have a compelling first picture because not only is that the thumbnail that people see in searches but also because it’s more likely to make it into a treasury. And remember, making it into a treasury is the way to make it onto the front page. So now, I try to think, “Is this picture front page worthy?” when I put in that preliminary photo.